What is the process of plea bargaining? Plea bargaining is a process in which the prosecuting attorney and the defense attorney bargain over the sentence to be imposed on the defendant. This process can occur at the time of the initial appearance all the way up to the time that the trial is supposed to take place. 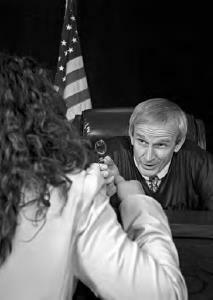 Usually, the plea bargaining process results in a defendant pleading guilty to a lesser charge. In other words, a defendant takes a plea to ensure a lesser sentence than if the case goes to trial and the jury issues a guilty verdict, which could lead to a much longer sentence. Thus, plea bargaining normally results in a reduced sentence for the defendant. In most cases, a defendant must appear in person before a judge, but some states allow the use of electronic audio-video communications to get the job done (iStock).